The Tampa Bay Bandits commenced their second United States Football League season by hosting one of six expansion teams, the Houston Gamblers, on February 26, 1984. The Bandits, coached by Steve Spurrier, had featured an exciting passing attack in the inaugural ’83 season, with 33-year-old QB John Reaves successfully reviving his career until breaking his wrist seven weeks into the schedule. WR Eric Truvillion was an All-USFL selection and all-purpose RB Gary Anderson joined the club as a high-profile rookie midway through the year, played well, and was now available for a full season. Tampa Bay just missed qualifying for the playoffs and was looking to move up in 1984. Houston had a high-profile rookie of its own in QB Jim Kelly, formerly of the Univ. of Miami and now starting behind center for the first-year club. While Head Coach Jack Pardee was known for his skill with building defenses, the team would be operating a wide-open “run-and-shoot” offense. There were 42,915 fans in attendance at Tampa Stadium. It looked good for the Bandits when they took the opening kickoff and drove to the Houston 14, but Zenon Andrusyshyn missed wide to the right on a 31-yard field goal attempt. Now it was Houston’s turn, and Jim Kelly completed four consecutive passes on a nine-play, 80-yard possession, the last of which resulted in a nine-yard touchdown to WR Ricky Sanders. Jeff Brockhaus added the extra point and the visitors had the early 7-0 lead. The Bandits again moved the ball effectively on their next series, but on a first down play at the Houston 27, John Reaves fumbled the snap and LB Rickey Young recovered for the Gamblers. Finally, at 3:15 into the second quarter, the Bandits got on the board when Andrusyshyn booted a 25-yard field goal. Andrusyshyn kicked another field goal for Tampa Bay with just under two minutes remaining in the first half, this time from 32 yards, making it a one-point game. They got the ball back and went ahead before halftime on a two-yard run by Gary Anderson. Reaves threw to WR Willie Gillespie for a two-point conversion and the home team took a 14-7 lead into the intermission. Houston came back in the third quarter to tie the score when RB Sam Harrell caught a pass from Kelly for a seven-yard TD and, with Brockhaus adding the point after, the tally was 14-14. Midway through the fourth quarter, the Gamblers drove deep into Tampa Bay territory, but on a third-and-goal play at the four yard line, an option run lost four yards and they had to settle for three points. Still, Houston went ahead when Brockhaus successfully kicked a 26-yard field goal. It seemed as though the field goal might be enough to pull off the upset. Tampa Bay appeared to be in trouble when, facing third-and-20 at the Houston 45, Anderson dropped a short throw from Reaves. But far from the play, Houston CB Donald Dykes was flagged for an illegal hit on Gillespie and the Bandits stayed alive with a first down at the 30. Reaves threw to Eric Truvillion for 17 yards and, with 2:33 remaining, Anderson took a handoff and ran 12 yards for a touchdown. The extra point attempt was unsuccessful, but the home team was ahead by three points. There was still plenty of time for the Gamblers, and they reached the Tampa Bay 39 with 57 seconds left on the clock. But on fourth-and-six, Kelly kept the ball on an option play and was stopped short of a first down by DE James Ramey. The Bandits ran out the clock to win by a final score of 20-17. Tampa Bay led in total yards (435 to 316) and time of possession, holding onto the ball some 15 minutes longer than the Gamblers. The Bandits also held a 28 to 18 edge in first downs, but they had difficulty making the most of scoring opportunities despite being inside the Houston 20 on five occasions. Each team turned the ball over twice. Gary Anderson had a big day , rushing for 114 yards on 26 carries that included two touchdowns and catching 6 passes for another 100 yards. With Houston’s defensive backs playing deep coverage, John Reaves used short throws effectively and completed 25 of 42 passes for 308 yards with one interception. Willie Gillespie, like Anderson, had 6 receptions, gaining 70 yards, and Eric Truvillion contributed 73 yards on his four catches. For the Gamblers, Jim Kelly had a strong performance in his pro debut, completing 24 of 41 throws for 229 yards and two TDs, although he also gave up two interceptions. Ricky Sanders caught 7 passes for 64 yards and a touchdown. WR Richard Johnson added 6 receptions for 44 yards and Sam Harrell gained 44 yards on 5 catches that included a TD to go along with his team-leading 57 yards on 10 rushing attempts. On defense, LB Andy Hawkins, formerly of the NFL Buccaneers, was credited with 11 tackles in his Tampa homecoming. Tampa Bay went on to win their next two games on the way to a 14-4 finish that was good for second place in the Southern Division. Qualifying for the postseason as a Wild Card, the Bandits lost their First Round playoff game to the Birmingham Stallions. The Gamblers recovered from their first week loss to win three straight contests on the way to a 13-5 record and first place in the Central Division. They also lost in the initial round of the postseason, to the Arizona Wranglers. Gary Anderson gained 1008 yards on 268 carries (3.8 avg.) and led the USFL with 19 rushing touchdowns. He also caught 66 passes for 682 more yards and another two TDs for a total of 21, tying for the league lead with New Jersey’s Herschel Walker. John Reaves stayed healthy and ranked second in passing yards (4092), attempts (544), and completions (313) while accumulating 28 touchdown passes against 15 interceptions. Ahead of him was Jim Kelly, who ranked at the top in yards (5219), TDs (44), attempts (587), and completions (370) in putting together a remarkable rookie year. 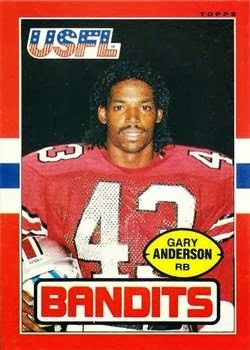 He received consensus Player of the Year and All-USFL honors.